Dogs have the highest rates of cancer on the planet. Not hungry street dogs in India. But our precious pets that are an important part of our family…. the ones we find great joy in as we purchase toys, expensive winter jackets and big fluffy beds for. Yet wolves, their ancestors, who eat primarily mice, rabbits, fish, and large game in season, have no cases of cancer recorded. I am not an expert on what to feed your pet. I know there are strong opinions on cooked food…versus raw food….versus vegan. 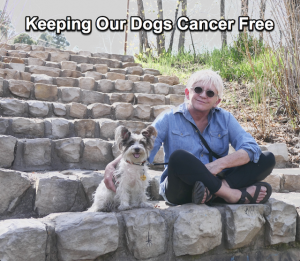 The objective of this newsletter is only to open a conversation about how many toxins our best friends are exposed to, because dog rates of cancer began to spike at the same rate as humans in the Western world, around 1980 and have continued to climb dramatically. Research suggests that cancer is actually a chronic inflammatory process that creates an environment in which abnormal cells proliferate. That inflammatory process is created by what we eat and the toxins we are exposed to. So to give our pets the most excellent health possible, we have to do an overview of what they are eating and the kind of environment in which they are spending their time. And then make a check list of what needs a detox. ONLY ORGANIC DOG FOOD WILL DO: “We are what we eat”, and so is your dog. Commercial non-organic pet food is some scary stuff, loaded with pesticides, antibiotics, synthetic fertilizers, growth hormones and GMO’s. “Because there are no standards for pet food, it may contain such unsavory things as newspaper, feathers, high-fructose corn syrup, cancerous or diseased animal tissue, bovine fetal tissue, and glandular waste”, according to Dr Andrew Weil. The animals rendered into many pet foods are classified as “4D: Dead, Dying, Diseased, or Disabled”. Sometimes called ‘animal meal’ or ‘animal by-products’ on the label. Avoid….Avoid….. The term “organic” is used widely today. But organic animal feed must meet production and handling requirements of the U.S. Department of Agriculture’s National Organic Project. Organic regulations specific for pet foods are currently being developed. In the interim, the NOP has said that pet foods claiming to be organic must meet its human food regulations. Certified organic foods will display a ‘USDA organic seal’ and must be made of at least 95% organic ingredients. CHECK THE TREATS: We all know it’s the snacking that can do in our best efforts. And so it goes for our pets. I know, nothing can melt your heart more than doggie eyes hoping for a treat. You know the way they look up at you with razor focus and zero into your soul. And then are so thrilled when you finally give in and offer them another little nibble. It’s like everyone is not just happy, but thrilled!!! Yet there are healthy treats and harmful treats. Many dog treats contain high fructose corn syrup. Cancer cells love sugar. There is no need to have sugar in dog treats. It’s not natural to their diet. Also you’ll want to consider Pet Chews. You know, those pieces of jerky they often have up front by the cash register in jars (even in fancy doggie boutiques). They may be chicken, duck and vegetable jerky from China. China dog food manufacturers have a history of poor quality and lack of standards on Pet Treats. Stick to snacks in packages where you can read the label, know the ingredients and where it is made. We are the eyes and ears for our pets. TOXIC PAWS: Where your dog walks, it ingests. This is a tough one, because it is difficult to protect them from everything. Our little dog Lillian is a ‘paw licker’. She can spend hours making a big wet mess, while contentedly licking her two front paws. We take Lillian everywhere with us, usually in urban environments. So we have to be vigilant as to where she walks, and to wash her paws often. Contrary to what lawn companies would like us to believe, lawn fertilizer and weed killer are toxic to pets. Pet oral and nasal cancer is on the increase in San Francisco. It is believed to be caused from the liberal spraying of the herbicide ‘Round-up’ in public parks and dog parks. Cancer develops from long term exposure. If a dog plays in grass for years that has been treated with herbicides it will add to your animal’s toxic load. Toxic Peak is when your animal’s system can no longer handle all the toxins it has been exposed to in it’s lifetime and disease sets in. The key is to concentrate day in and day out to keep your pet’s toxic exposure as low as possible. That’s the goal. Keep your pal’s life clean and it just makes sense that your pet has a better chance of living a long, healthy life. I invite you to share how you feed your pet. What kind of discoveries have you made to keep your pet healthy? We all learn together as a community….. Learn to make foods closer to Nature. Get healthier, teach your families and your communities. It’s a new day and a new way. 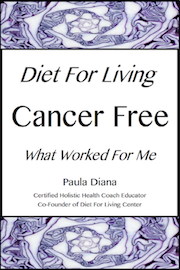 I share everything I have learned in my e-book DIET FOR LIVING CANCER-FREE/ What Worked For Me by Paula Diana. Make a difference in your life and in the lives of others! Please share us with friends and family.